From all of my hill travels, I have learnt one thing. That you need to dedicate one separate day just exploring Instagram Worthy Cafes. We did the cafe hopping in Shimla, and this time I allocated special time for Instagram Worthy Manali Cafés. Luckily for me, there were far too many to check out. I put on my food critic hat and in this blog post, I share some of my favourite eating joints in Manali. If you are new to Manali, there is just one thing you need to know. 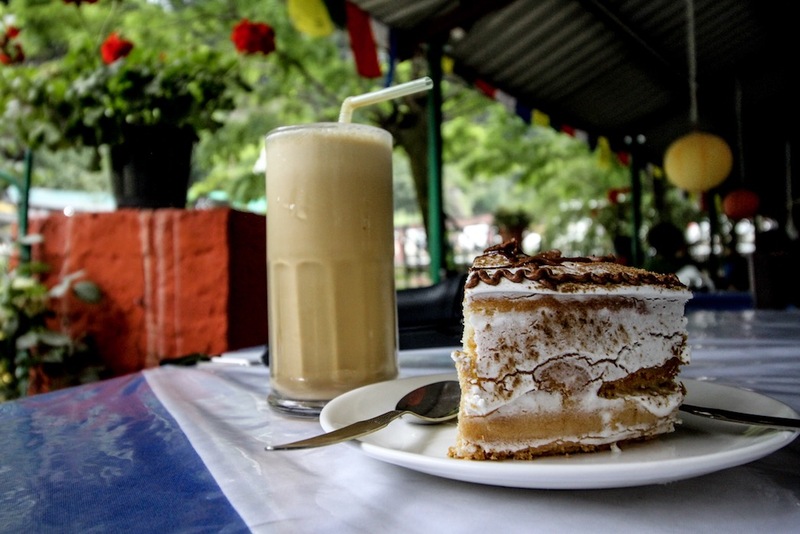 All of the awesome Manali Cafés are located in the Old Manali area. Old Manali is situated next to the Hidamba Temple. You might want to book your stay around this place to enjoy Instagram Worthy Manali Cafés all day long. These Instagram Worthy Manali Cafés are open throughout the day till late evenings. Bonus: Some of them even have live concerts every evening of the week. You will see placards and boards outside these cafes mentioning free entry and the concert singer of the day. Both afternoons and late evenings. Afternoon lunch would mean you can get gorgeous images of the cafe surroundings along with interior pictures. Not all cameras work like magic in dim light. So make sure you target your favourite Instagram Worthy Manali Cafés during daylight. In the evenings, it is best you leave your gadgets aside and enjoy the live music, the beautiful candlelit dinner and the scrumptious food. Most of these cafes have stunning views of the river Beas making it a dream dinner date. How expensive are these Instagram Worthy Manali Cafés? The price range for food starts anywhere from INR 200 a dish to INR 600 for fancy seafood etc. Depending on your culinary tastes, you can pick and choose the cafes you’d like to spend money in. Take, for instance, I didn’t want to spend a ton of money (upwards INR 1500) for a meal, so instead, we did regular coffee or desserts in the expensive cafes. That way, we still got to enjoy the views and the ambience while still being able to afford our next meal. Now I should tell you upfront that the food in Manali as good as it looks, tastes kind of so-so. I mean we really tried multiple places before coming to this conclusion. All the more because the Shimla Cafes are truly a culinary delight. The food in Shimla is top quality, which unfortunately is not the case in Manali. But nevertheless, this is about Instagram Worthy Manali Cafés. See what I did there? The focus of this blog post is not the food entirely, but the overall experience at the cafe. Sitting on the highest point of Old Manali bazaar, this cafe is a hit and miss if you don’t know where to look. But once you’re inside, the view from this place is spectacular. While most of the other popular cafes in Manali are always overcrowded, this one though was completely secluded away from the noise. The only noise here is the roar from the river flowing downstairs. You can see gorgeous dense deodar forests all around, and some beautifully hidden huts among the trees. Makes you want to have a hill home yourself. At least I know I did. INR 300 to INR 500. You mostly get Italian dishes here. Take a walk through the Old Manali area. Climb up the hill towards the Manu Temple. This cafe sits right next to The Lazy Dog Cafe. Its entrance is on the curve of the hill. There is a small placard leading the stairs up to the cafe. Ask anyone around, and they should be able to guide you to this place. This is a new cafe that has opened just a month or so back. So you might have some trouble finding it. Just call on the number mentioned below if you get lost anywhere. This was the first cafe we explored for a dinner date with my husband. It was the perfect setting. The cafe is quite popular in Manali, so you might have to wait for a table. But it is well worth it. We had a beautiful candlelit dinner setting with an isolated table just for us overlooking the Beas River. Sometimes, the view and the ambience more than makes up for the price you pay. The minute you enter the cafe, you see this bright yellow wall with loads of frames and wooden interiors all around. The cafe pretty much stands out from the rest just based on its overall look. What I loved most is seeing a milestone with the Cafe 1947 inscribed on it. A pretty cool idea, eh? Fish & Chips for me. Chicken Double Burger for the boy. All you need to do is cross the bridge for Old Manali, and the cafe is right on the corner when you turn left. The best view of zip-lining activities on the Beas river can be seen from this cafe. Try to grab the riverside seats if you can for the best experience at this place. We, unfortunately, couldn’t get the riverside seats, but it was nonetheless a good afternoon break from all the sightseeing. This place is pretty affordable. We didn’t try their main course, but the dishes looked yummy. Most of the items were priced in the INR 80 to INR 250 range. Once you cross the bridge towards Old Manali, you need to turn right and this would be the first or second cafe on the road. The thing with popular cafes is you will always find a crowd in there. Which is why we chose to enter Richik’s Cafe. The cafe is located just next to Cafe 1947 but is pretty secluded in a way that you get your privacy while admiring the nature all around. We spent a good long afternoon just chilling by the river and quite frankly, that experience just topped everything else. This is one of the more affordable cafes. Prices start from INR 150 to INR 300 a dish. Just ask anyone for directions to Cafe 1947, and you will spot Richik’s Cafe right next to it. We had heard some amazing reviews about The Lazy Dog while researching for cafes in Manali. This one was right at the top and surely, the place was totally Instagram worthy. The wooden interiors with the contrast blue sofas, the gorgeous lush green backdrop, it was all very very pretty. Plus, if that wasn’t enough, they even had a big open space for outdoor seating overlooking the river. The place is a bit pricey. We paid roughly INR 500+ per dish. But the ambience is great. So it’s a good place to chill out after a long day of sightseeing. You can ask anyone for directions to this cafe. It sits on the top of the hill on Old Manali Road. This is one of the highly recommended Manali Cafes to visit. We read about it on the internet, through friends recommendations and yet ended up checking out the other cafes. There are just too many Instagram Worthy Manali Cafés. You need at least a week to just hop from one cafe into another. You know some cafes are too cool even for me. There were plenty of biker cafes in the old Manali area. I just thought I wouldn’t fit in with the cool hep crowd here. Although, this cafe is super gorgeous. Anyone dreaming of Leh Ladakh looking at this picture? One of the most premium eating joints in the whole of Manali. Every corner of this property is Instagram worthy. Mind you, the place is quite pricey. But the ambience is well worth it. They also have live music and concerts on weekdays as well as on weekends. So maybe visit this place around that time. Ideally speaking, you can get special brownies pretty much anywhere in Manali. But this restaurant guaranteed has them made on special orders. So in case you wish to have some fun, you know where to stop by. Do you have any other Instagram ready Manali Cafe recommendations? Best Rohtang Pass Travel Tips That Will Help You Save Money!